YEARS ago, while working in California, I met an Argentinian of Co Clare extraction who spoke English with a Spanish inflection and sang Irish songs, learned from the Christian Brothers, with an Irish lilt. His pride in Ireland intrigued me and over the years I learned Argentina is home to the world's fifth largest Irish community. Hurling was played consistently up until the Second World War, its legacy still seen in the Hurling Club which fields hockey and rugby teams. The Asociación Argentino Irelandesa and the Southern Cross newspaper help Irish Argentinians keep in touch with their cultural heritage. So earlier this year I decided to visit Argentina. Compared to other South American cities Buenos Aires has a very European look and feel. Our hotel was in the Retiro district, which has the architecture of a past-its-prime residential area. It is also home to a number of Irish pubs that are authentic in look only. Like many so-called Irish pubs, these have yet to realise that an Irish pub is about craic and atmosphere. I much preferred sitting outside a café, with a civilised litre of Patagonian beer where an elderly lady complimented me on my Irish cricket shirt and blew me a kiss. In one of the city's many famed steak houses I had one of the best steaks of my life; my wife, who asked for a small steak, was overwhelmed with the size – and all for US $20. Our guide Augustin, who was indispensable with his advice on all matters, informed us that the reason we were on our own in the restaurant, at 7pm, was due to porteños, as the denizens of Buenos Aires are known, not eating until 10pm. Another day saw us in the La Boca area, home of Maradonna’s former team Boca Juniors. Caminito street, with its cobblestones, colourful corrugated-iron houses and artists’ studios, is a must-see but be prepared for hawkers and male and female tango dancers who will athletically and provocatively drape themselves around you for an over-priced photograph. A couple of words of warning from our guide: don’t stray off the tourist path and don’t wear a River Plate (Boca Juniors' greatest rivals) shirt. Recoleta cemetery is the final resting place of Eva Peron. It is a massive cemetery and testament to the honour the Argentinians bestow on their dead. William Brown, the Irish-born founder of the Argentinian navy is interred here; his mausoleum was partially built with the melted-down bronze from the cannon of the ships he once commanded. Just across from his tomb, which is painted green, is that of Galway-born Fr Fahy, regarded as the patriarch of the Irish in Argentina. We drove down 9 de Julio Avenue, whose name recalls Argentina’s independence day in 1816. 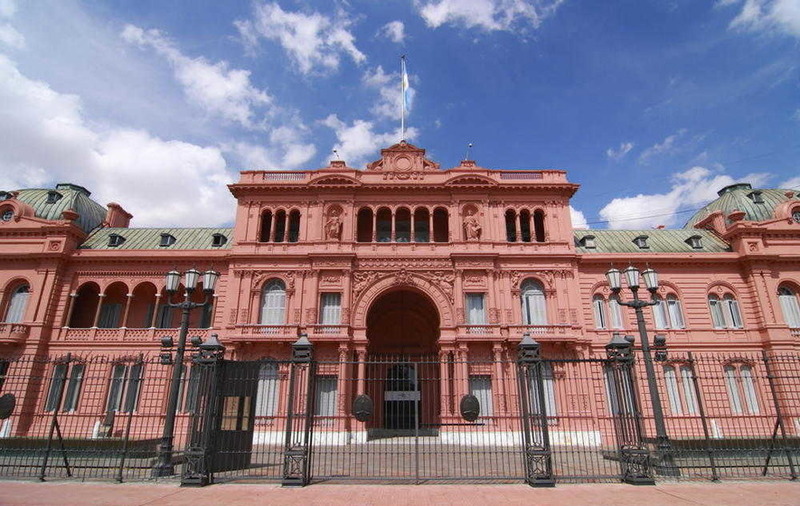 The Plaza de Mayo is home to the Casa Rosada (Pink Palace) the presidential mansion and one of Argentina's most emblematic buildings, with its balcony from which Eva Peron famously spoke – at least in the film version! There's a heavy police presence here as the Plaza de Mayo is the square where Argentinians, including the Mothers of the Disappeared whose children were murdered under the military dictatorship of the 70s and 80s, stage political protests. Across from the Casa Rosada is the Metropolitan Cathedral where Pope Francis ministered up until five years ago. A hidden gem is the alcove containing the mausoleum of national hero General San Martin, guarded by two sombre soldiers. One evening my wife accompanied some of our fellow travellers to – in her words – “a superb dinner and Tango show" while I enjoyed another quality steak and continued my research in the hostelries of Buenos Aires. Early the next day we took a flight to Iguazu Falls, a truly wonderful sight with its 275 discrete falls, where we walked through sub-tropical jungle with beautiful butterflies and too-friendly coatis, members of the raccoon family, foraging for food. The falls straddle the Argentina-Brazil border, with 80 per cent in the former country; however, the Brazilians say that Argentina may have most of the water but they have the best views of Iguazu. 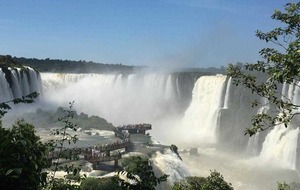 It was hard to argue with this as, having checked into a hotel on the Brazilian side, we walked the river canyon where we were treated to spellbinding views of all the falls. Some of our tour group visited the Parque de Aves (Bird Park), a private zoo near the falls, with its aviaries of beautiful native birds, including toucans and macaws; a few of our more adventurous travellers took a helicopter ride over the falls – expensive but worth the cost, they declares. A major downside of Iguazu is that mosquitos flourish here – insect repellent is essential. Having also travelled to Peru and Bolivia on my South American Odyssey – Rio de Janeiro is next in our itinerary – I'm finding South America a continent of contrasts in terms of scenery, people, cities and climates. If, like me, you are visiting the continent for the first time and unsure of what to expect, consider a guided trip. We had the services of a great guide who was informative, friendly and expedited visits to major attractions. We stayed in comfortable hotels with good food and all transport and transfers were laid on for us.